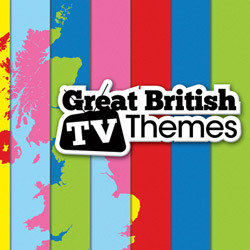 A bumper 2 CD set of 54 tracks that spans over half-a-century of classic British TV themes from the pirate accordion of Captain Pugwash through to Barrington Pheloung’s distinctive music for Lewis. Music from an era when British TV promised quality productions, star names and instantly recognisable themes. Includes worldwide TV smashes Danger Man, The Avengers, The Saint, Man In A Suitcase, The Prisoner, Randall And Hopkirk (Deceased), UFO and The Persuaders, all still regularly screened over 40 years later. Covering all elements of the genre from the deceptive strings of Fawlty Towers to the strident military march of Monty Python’s Liberty Bell to the sombre and chilling theme to the WWII documentary series World At War. This is a feast of vintage telly tune nostalgia.